Neyber will be at this year’s EB Connect on 1 March 2017 at Park Plaza, London. Visitors should sign up to Neyber’s roundtable, which will offer a sneak preview of this year’s DNA of financial wellbeing research. 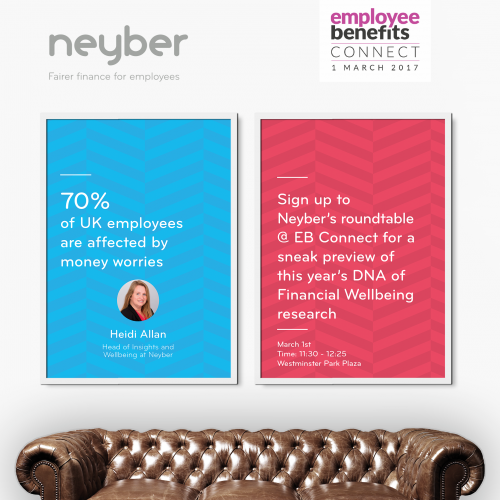 Visit the Neyber lounge at Stand D02 to pre-register for your own copy of Neyber’s research when it’s hot off the press. Heidi Allan, head of insights and engagement at Neyber, will also be presenting a session on ‘Exploring the future of personal finances to build a healthier more productive workforce’.